I wanted something besides potatoes to go with a pork tenderloin I was grilling the other night. While at the grocery store, I picked up a box of Rice-A-Roni wild rice, and checked out the sodium content. As expected, it was ridiculously high, somewhere in the 40% of my RDA for sodium range. The recipe below probably isn't THAT much better, but at least I knew I could control it. I made it almost as stated on Allrecipes.com, but instead of the vegetable broth called for I used chicken base and water; plus, I did not have celery, so I used celery salt (yes, more salt). Actually, as far as the salt goes, I look at this as the baseline. Next time I will add less chicken base, or use celery seed or actual celery, instead of celery salt. 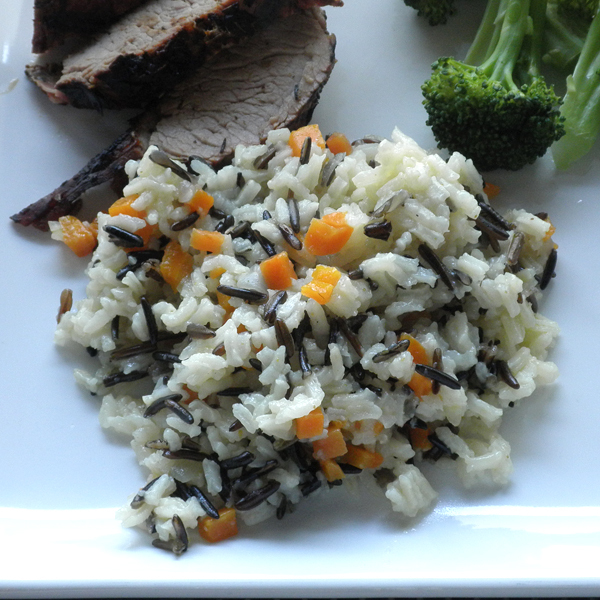 In any case, this is a great rice dish: flavorful, fresh, and with great texture from the wild rice. It will be placed into my side dish rotation. Heat olive oil in a medium size heavy saucepan over medium heat. Add onion, carrots, garlic, and celery salt and cook until vegetables are tender. Stir in water, chicken base and wild rice. Heat to a boil; reduce heat, cover and cook over low heat for 25 minutes. Stir in white rice. Cover and cook over low heat for another 20 minutes, or until liquid is absorbed and rice is cooked.